Moisture is essential to keeping skin and hair looking healthy, supple and smooth. 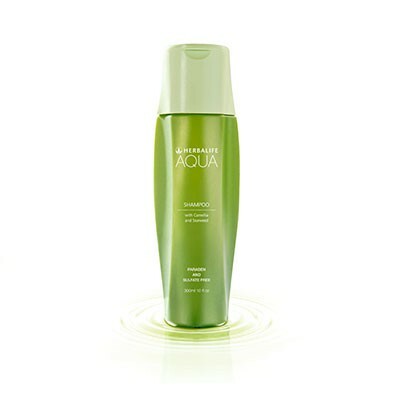 Moisture is what HERBALIFE® AQUA Shampoo brings in abundance to your hair from root to tip. Combining natural botanicals, HERBALIFE® AQUA gives your crowning glory a vitalizing glow from the inside out. Keeps hair and scalp clean and healthy Maintains moisture level for healthier hair Paraben and sulfate free formula is perfect for daily use Fruity green fragrance keeps hair smelling fresh all day. HERBALIFE® AQUA is formulated to the highest safety standards in product development, utilising only natural and proven ingredients including extracts from seaweed and Camelia Japonica, that lets your hair and scalp enjoy the pampering touch of nature every day. Massage a small amount into wet hair and scalp and work into a rich lather. 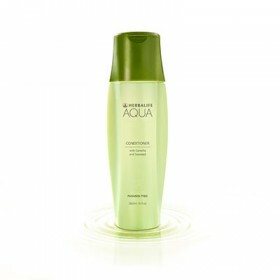 Follow with HERBALIFE® AQUA Conditioner. Benefits of Seaweed Extract Moisturising essence drawn from three kinds of mineral-rich seaweed Protects cuticles and smooth-coats hair for natural shine and silky feel Supports moisture balance of scalp for healthy hair growth Benefits of Camelia Leaf Extract Deeply moisturising essence for hair and scalp Protects cuticles and coats hair for smooth feel Maintains healthy scalp and protects from developing dandruff.